SSPC is a short form of Steel Structure Painting Council. SSPC: The Society for Protective Coatings was founded in 1950 as the Steel Structures Painting Council, a non-profit professional society concerned with the use of coatings to protect industrial steel structures. SSPC creates, publishes and maintain standards for coatings that protect and preserve concrete, steel and other industrial and marine structures and surfaces. These standards address surface preparation, coating selection, coating application, environmental regulations and industry health and safety issues to the coating industry. SP1 - Solvent Cleaning: The method of solvent cleaning is intended to remove “all visible oil, grease, soil, drawing and cutting compounds, and all other soluble contaminants from steel surfaces.” by cleaning with solvent, vapour, alkali, emulsion or steam. SP2 - Hand Tools Cleaning: This standard covers the removal of loose mill scale, loose rust, loose paint, and other loose detrimental foreign matter from surfaces with the use of non-powered hand tools. Cleaning by chipping, scraping, sanding and wire brushing to a specific degree. Equivalent to ISO St2 Grade. SP3 - Power tool cleaning: A mechanical method of surface preparation widely used in industry and involving the use of power sanders or wire brushes, power chipping hammers, abrasive grinding wheels, needle guns etc. Although usually more effective than hand tool cleaning, it is not considered adequate for use under severe exposure conditions or for immersion applications. Equivalent to ISO St3 Grade. SP4 - Flame Clean: Removal of all loose scale, rust and other detrimental foreign matter by passing high temperature, high velocity oxy-acetylene flames over the entire surface, followed by wire brushing. Surface should also be free of oil, grease, dirt, soil, salts and other contaminants. SP5 - White Metal Blast Cleaning: The removal of all visible rust, mill scale, paint and contaminants, leaving the metal uniformly white or grey in appearance. This is the ultimate in blast cleaning. Use where maximum performance of protective coatings is necessary due to exceptionally severe conditions such as constant immersion in water or liquid chemicals. Equivalent to ISO Sa3 Grade and NACE #1 Definition. SP6 - Commercial Blast Cleaning: All oil, grease, dirt, rust scale and foreign matter are completely removed from the surface and all rust, mill scale and old paint are completely removed by abrasive blasting except for slight shadows, streaks or discolorations caused by rust stain, mill scale oxides or slight, tight resides of paint or coating that remain. If the surface is pitted, slight residue of rust or paint may be found in the bottom of pits; at least two-thirds of each square inch of surface area shall be free of all visible residues and the remainder shall be limited to the light residues mentioned above. Equivalent to ISO Sa2 Grade and NACE #3 Definition. SP7 - Brush Off Blast Cleaning: A method in which all oil, grease, dirt, rust scale, loose mill scale, loose rust and loose paint or coatings are removed completely. Tight mill scale and tightly-adhered rust, paint and coatings are permitted to remain. However all mill scale and rust must have been exposed to the abrasive blast pattern sufficiently to expose numerous flecks of the underlying metal fairly uniformly distributed over the entire surface. Equivalent to ISO Sa1 Grade and NACE #4 Definition. SP8 – Pickling: Complete removal of rust and mill scale by acid pickling, duplex pickling or electrolytic pickling. SP9 - Weather and Blast: Weathering to remove all or part of the mill scale followed by one of the blast cleaning standards. SP10 - Near White Blast Cleaning: In this method, all oil, grease, dirt, mill scale, rust, corrosion products, oxides, paint or other foreign matter have been completely removed from the surface by abrasive blasting, except for very light shadows, very slight streaks or slight discolorations caused by rust stain, mill scale oxides or slight, tight residues of paint or coating. Blast cleaning nearly to “White Metal” cleanliness, until at least 95% of the surface area is free of all visible residues. Equivalent to ISO Sa2.5 Grade and NACE #2. SP11 - Power Tool Cleaning to Bare Metal: Utilizing same equipment as Power Tool Cleaning to remove all visible coatings and contaminants to bare metal substrate. It will be applicable where abrasive blasting is not feasible or permissible. SP12 - Surface Preparation and Cleaning of Metals by Water jetting Prior to Recoating: Water jetting is the use of standard jetting from a nozzle at high pressures (10,000 psi or higher) to prepare a surface for coating. Intended primarily for carbon steel, but applicable on other metals, water jetting does not create a profile on the metal substrate. However, metals with an existing profile acceptable for painting can be cleaned with water jetting to expose the existing profile. Water jetting will remove all loose rust, loose mill scale, and loose coatings uniformly. SP13 - Surface Preparation of Concrete: Describes requirements for mechanical, chemical and thermal methods of concrete surface preparation to improve the adhesion and longevity of coating systems. This standard applies to all types of cementitious surfaces including cast-in-place concrete floors and walls, precast slabs, masonry walls, and shotcrete surfaces. 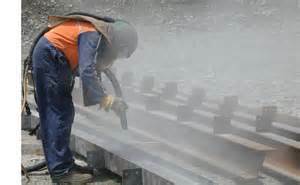 SP16 - Brush-Off Blast Cleaning of Coated and Uncoated Galvanized Steel, Stainless Steels, and Non-Ferrous Metals.